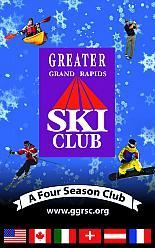 Thank you for visiting the Greater Grand Rapids Ski Club website. We are glad you stopped by. GGRSC is a four-season (ski, golf, paddle, etc.) non-profit club based out of Grand Rapids, MI. We've been in existence since 1969 (starting out as the Lincoln Ski Club) and currently have over 300 members. 2019 was a great year with ski trips to: France, Whistler, Steamboat Springs and Ogden. 2018 had trips to: Mont St. Anne/Quebec, Italy, Lake Tahoe and Whitefish Mountain. If you are just learning to ski or snowboard or are an advanced veteran of many winter seasons, come and join us. We are a fun loving group that likes to keep active year around. Anyone 18 years or older can join. Some of our activities include: cross country skiing, alpine trips (US and Europe), hiking, biking, kayaking, golfing, and camping. Join or renew today! Dues are $35/year ($30 if paid between July 1 and October 31st). Just complete a membership application and pay your dues (can all be completed online). We look forward to a fun season! Be sure to follow us on Facebook.